The market research company Ceresana analyzed the global market for adhesives and sealants based on polyurethane (PUR) in detail. Until 2024, Ceresana expects an increase in revenues generated with these products to over USD 9.7 billion. Adhesives and sealants based on other products are NOT included in this study. Polyurethanes are plastics resulting from a polyadditional reaction of polyisocyanates with polyols and are either hard and porous or soft and elastic depending on its production. Different kinds of PUR are needed for reactive, thermally activated, hot melt, dispersion, and solvent-borne adhesives. These adhesives are for example used to bond car front spoilers, sandwich constructions, and facade elements, to glue metal brackets, or to seal electronic casings. PUR Sealants are particularly utilized in the transport industry as well as in the construction industry for window joints, and sealing of windows, pipes, and more. Chapter 3 analyzes the regional markets for adhesives and sealants: Data and influencing factors on the use in the segments construction, wood processing, transportation, shoes and leather, packaging, and other application areas. 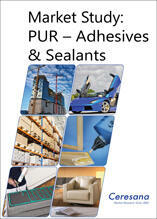 Chapter 4 provides profiles of the largest manufacturers of PUR adhesives and sealants – clearly arranged according to contact details, turnover, profit, product range, production sites, and profile summary. Extensive profiles of 69 manufacturers are given, including 3M Company, Ashland Global Holdings Inc., BASF SE, Covestro AG, DIC Corporation, DowDuPont Inc., Henkel AG & Co. KGaA, Huntsman International LLC, and Illinois Tool Works Inc.